Injection Molded Plastic Letters by Gemini combine the attributes of several other letter types. They are made from C.A.B. (Cellulose Acetate Butyrate), a renewable resource (non-petroleum) plastic for incredible durability. They also are created using precision tooled molds for razor sharp edges and extra dimension. 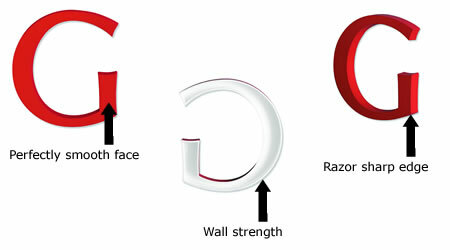 While still a plastic letter, they are suitable for many 'up-close' applications – even in small sizes. Metal finishes make it hard to tell them form the real thing. Serifs are always sharp, edges always crisp. Where to Use Gemini Injection Molded Plastic Letters. For examples of our injection molded plastic lettering, please visit our Product Gallery.